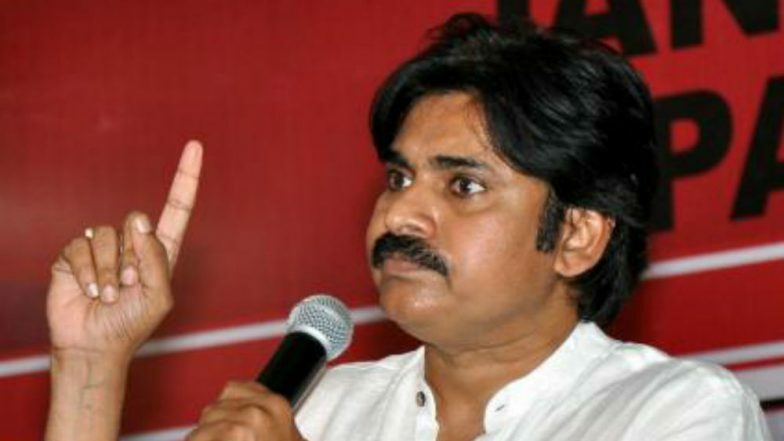 Hyderabad, March 18: The Jana Sena Party (JSP) released a list of 32 candidates who will be contesting for assembly elections and one candidate for Lok Sabha elections in Andhra Pradesh. Pawan Kalyan's JSP also announced one candidate from Telangana for contesting Lok Sabha elections. As per the circular released by the JSP, former Congress leader Nadendla Manohar, who joined the party less than a year ago, has been given Tenali ticket, while, Thota Chandrashekar, a former IAS officer has been given Guntur West ticket. Mayawati Should be Next Prime Minister of India, Says Pawan Kalyan. Former Indian Railways officer, Dr A Bharat Bhushan, has been given Vemuru Assembly ticket. Ravela Kishore Babu, a minister who quit Telugu Desam Party (TDP) citing discrimination, will be contesting from Prathipadu. Meanwhile, Gedela Srinu Babu, who was given the Visakhapatnam seat, joined the Yuvajana Sramika Rythu Congress Party (YSRCP) on Saturday. Pawan Kalyan Not to Attend All-Party Meeting Called by TDP Chief Chandrababu Naidu. Earlier, the actor-turned-politician had announced an alliance with Bahujan Samaj Party for the upcoming elections. According to the seat-sharing pact, BSP will be contesting in 21 Assembly seats and three Lok Sabha seats. Pawan also informed media that BSP will contest from Chittoor, Tirupati and Bapatla Lok Sabha constituencies. In a press conference at Lucknow, on Friday, Kalyan said, "We would like to see Behen ji Mayawati ji as the Prime Minister of our country, this is our wish and our ardent desire." Replying to Kalyan, Mayawati said she wished to see Pawan as the next Andhra Pradesh Chief Minister.